Man, was it nice out today or what? Seriously. This is why Spring quarter at UW is impossible. The sun comes out and you have no desire to go to class. But, nevertheless I made my rounds today. It was nice to be able to just hang outside and just enjoy the weather over some Caramel (Care – a – mel) Rumble with Jamie after class. But, in other news, I was hit by a car today on my way to the IMA with Kony for my intramural soccer game. Yeah, it was exciting. For more great stuff click on. The best part of this picture is not the fact that we are fake kissing, yes it’s fake. 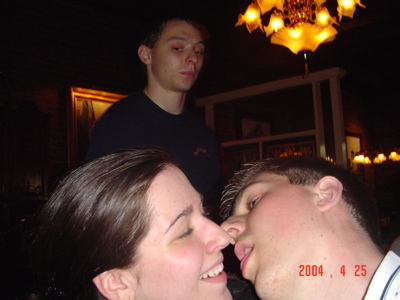 It is the look on that guy’s face behind us. Priceless. 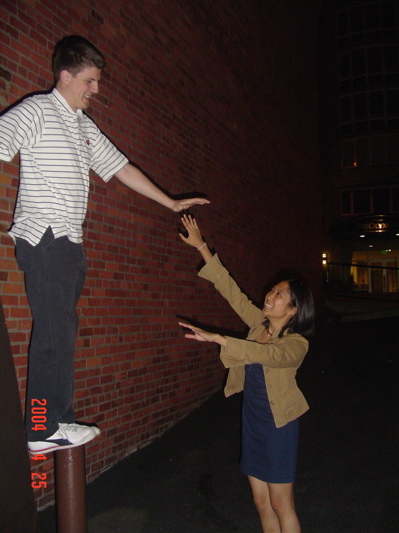 Yes, this picture is properly titled “Tall Ryan.” If she thought it was though to reach before, it is way tougher now.